Ideal for integrator demos, the newly released 'Jurassic Park' $50 box set features UltraHD and Blu-ray disc versions of the first four Jurassic Park movies in 4K HDR with DTS:X immersive audio. The Jurassic Park eight-disc box set is available for an approximate price of $50. 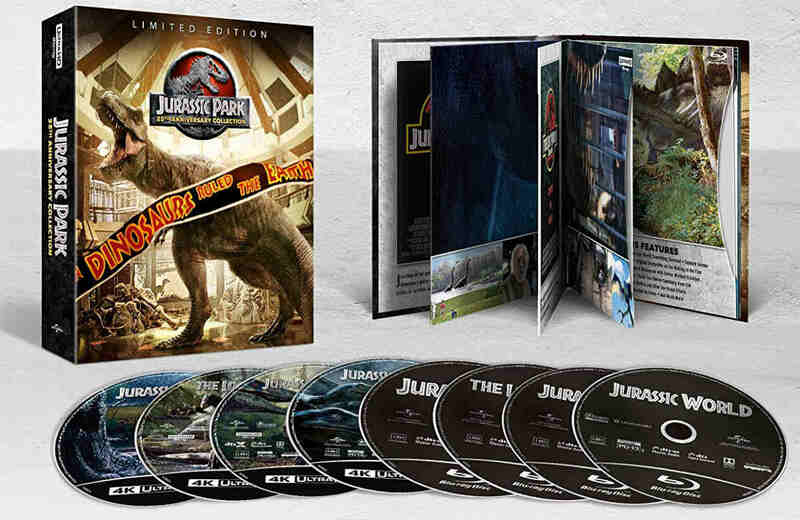 Integrators have some new dynamic 4K object-based audio demo material to use with their clients with the release of a new eight-disc box of the first four Jurassic Park movies in UltraHD 4K and Blu-ray versions. The $50 box set unveiling was timed to coincide with the release of the latest Jurassic Park movie—Jurassic World: Fallen Kingdom. Naturally, the box set includes a number of bonus features, including the making of the first three movies, storyboards, and deleted scenes. It also includes a video titled Jurassic World All Access Pass and a feature called Dinosaurs Roam the Earth Again. What makes the box set noteworthy is the level of restoration Universal, along with its partners Legendary Entertainment and Amblin Entertainment, undertook to ensure the release delivers on both 4K and surround sound. Integrators and home A/V enthusiasts, as well as movie fans, will be most interested in the videos’ use of 4K and DTS:X technologies that are a central part of the box set. The first three movies were shot on 35mm film and digitally upgraded to 4K, while the fourth movie, Jurassic World, was shot in a native digital format and transferred to 4K video. The home videos also provide high dynamic range (HDR), but since it’s not specified within the box set my guess is the movies use the industry standard HDR10 format. On the audio side, the original Jurassic Park movie helped popularize DTS as a surround sound option, and for the UltraHD box set, the 4K discs provide DTS’ new DTS:X object-based surround sound format. As a quick reminder, object-based surround sound places “objects” within the listening space rather than channels. These placement options enable mixing engineers the ability to immerse audiences in sound above their heads in addition to in front, the sides, and rear. For my review of the four UltraHD discs, I used an Optoma UHZ65 4K projector, along with a Stewart Filmscreen Phantom HALR screen, and an LG UltraHD disc player. Handling my system’s audio is an Onkyo RZ-810 receiver, Triad left, center, and right speakers, and a pair of Triad 10-inch subwoofers. Taking care of the surround duties are four Emotiva E2 AirMotiv speakers, and a pair of Atlantic Technology 44DA Dolby Atmos upward firing loudspeakers. Connecting all this gear together are Metra Home Theater and FIBBR HDMI cables. About one year ago I wanted to revisit the original Jurassic Park movie, but I didn’t want to watch the DVD version I already owned. Finding the Blu-ray version on sale, I purchased the disc to revisit the movie. Looking back at the Blu-ray version, I liked watching it, but I wasn’t blown away. UltraHD 4K doesn’t always mean a dramatic step up in quality, but fortunately, the 4K Jurassic Park movies do not underwhelm. Starting with the 25-year-old original, the first thing I noticed wasn’t the video quality, but how the disc automatically defaults to DTS:X as the standard audio format. I wish all movies did that! Another thing I liked was how each movie in the box set had easy-to-navigate menus to make sure I was in my preferred audio format. To demo subwoofers, the scene when the T-Rex finally finds her baby within the trailer of the scientific staff provides lots of low-frequency content with high sound pressure levels. 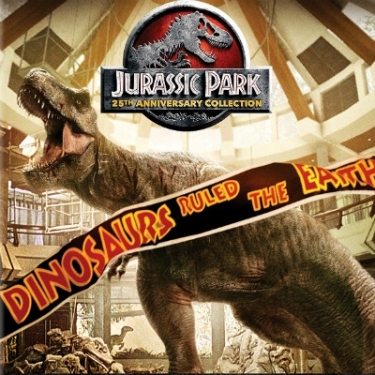 If you are looking for specific scenes to demo with clients, the first movie wastes no time delivering the goods, with the park employee eaten by the velociraptor and the scientific team flying to the island to investigate. In these scenes, the audio effects were placed precisely in the surround mix to envelop listeners in the sound of the dinosaur’s dinner. Similarly, the visual quality of the helicopter flying over the deep blue ocean and stirring up the green vegetation of the island looked captivating. One of the more subtle ways in which DTS:X was used in the helicopter scene was the way the sound of the humming propellers sat omnipresent in my A/V space. Some other notable immersive audio scenes were the scene where the cow is fed to the velociraptors and the ensuing swirling sound of their feeding frenzy, as well as the "in-the-moment" envelopment of the computer tech Dennis’ attempt to get to the island's shipping docks. This scene wrapped the sounds of the jungle around my seating area. In my judgment, the second movie, The Lost World, is the weakest of the franchise, but there were still plenty of cool moments that make the UltraHD disc worth demoing.Like the first movie, the action starts right away, with the opening scene depicting a little girl getting eaten by a pack of small dinosaurs. The Jurassic Park 25th Anniversary Collection includes 4K UltraHD discs for all four movies, as well as Bluray copies. Several minutes into The Lost World there’s an excellent moment in which the side channels were used nicely to put viewers into the action of Ingen workers trying to capture a small dinosaur. In the surround mix, the men’s voices could be heard shouting instructions from the left and right side surrounds. To demo subwoofers, the scene when the T-Rex finally finds her baby within the trailer of the scientific staff provides lots of low-frequency content with high sound pressure levels. Immediately afterward, there’s also an effect that sweeps from left to right across the soundstage to add some finality to T-Rex’s visit to the camp area. One other nice scene that was fun was the escape off the island. In this scene, the helicopter could be heard flying overhead from the front to the back of the room. Wrapping up the three classic Jurassic Park movies, I transitioned into Jurassic Park III.The second movie doesn't look as bright as the original Jurassic Park, but it still looked nice in comparison to some of the other formats I've seen the movie in. While 'Jurassic Park III' might have the least overall action of the original trilogy, it may offer the best surround sound action in the entire box set. Visually, I thought the third movie looked better than the second movie. For example, the movie opens with a nice shot of the ocean and the island in the background. The blue in the ocean had a nice rich look to it, contrasting with the green of the jungle. While Jurassic Park III might have the least overall action of the original trilogy, it may offer the best surround sound action in the entire box set. The third movie’s first attack scene features a dinosaur knocking the Kirby family’s plane from the runway as the plane attempts to escape dino dinner time. Not able to make it off the runway, the T-Rex swats the plane down, while the surround mix utilized a rolling, swirling sound effect. Towards the end of the movie as the Kirbys and Dr. Grant are trying to get off the second Jurassic island, they are cornered by a pack of velociraptors on the beach. In the left and right rear surrounds, as well as the height channels, you can hear the raptors communicating. Released in 2015, Jurassic World marks a new era of dinosaur movies, and the basic premise of Jurassic World is that a rich investor takes over John Hammond’s dream of building a successful dinosaur theme park. Just like in the first movie where the park’s management doesn’t respect the carnal instincts of these prehistoric animals, mayhem begins when a hybrid, lab created super dinosaur escapes captivity. Aesthetically, Jurassic World looks phenomenal. Several reports on the Internet state the movie was shot with cameras capable of delivering up to 6K in resolution. Whatever was done, the proof is in the pudding. The movie is the best looking of the four movies, and naturally, the special effects look the most realistic. From the opening scene of the baby dinosaur hatching from an egg, the picture delivers tons of detail with bright, punchy colors, and nice levels of brightness. The movie’s audio was equally as good. The mix doesn’t quite take advantage of the object-based format as much as the other three movies, but this soundtrack may offer a better dynamic experience. I thought the LFE channel was integrated better, and basic elements such as the cinematic movie score sounded bigger and more articulate. A highlight A/V moment in Jurassic World finds the velociraptors running through the jungle on the hunt, looking for the hybrid dinosaur. The action of the raptors running through the jungle surrounded my family and me and added to the dramatics of the scene. I thoroughly enjoyed these movies, and part of the enjoyment is due to the restoration efforts put in by Universal. Integrators will enjoy using these as demo material. Unlike some 4K releases, it’s clear that Universal didn’t simply go through the motions in providing value to Jurassic Park’s legions of fans through the addition of 4K and immersive audio. The best part for me was my kids’ reaction to the movies. They had never seen them before, and my 11-year-old son and 13-year-old daughter absolutely loved the box set. The 4K discs with DTS:X sound deliver high levels of A/V quality, entertainment, and through the $50 street price, high levels of value.